I got this recipe from Champa's blog. She has suggested few variation to her original tomato thokku recipe. I used her ideas and prepared this yummy thokku. Thanks to Champa for this lovely recipe. 1. Boil water, put tomatoes and cover with lid. Take out after 3-4 minutes, cool and remove the skin. Grind to a fine paste in mixer. Keep aside. 2. Heat oil in a pan. Add mustard and once they splutter,add asafoetida and fenugreek seeds. Now, add chopped onion. Fry till they turn golden brown. 3. Then, add pureed tomatoes, salt, jaggery and red chilli powder. Mix well. 5. Serve with Chapathi or Rice or Idly or Dosa. This can be stored in a clean and dry air tight container in a cool place for a minimum of 15 days. Remember to use clean, dry spoon. Nice looking thokku. Thanks for trying Nithu. Wow!lovely tempting and droolworthy thokku. 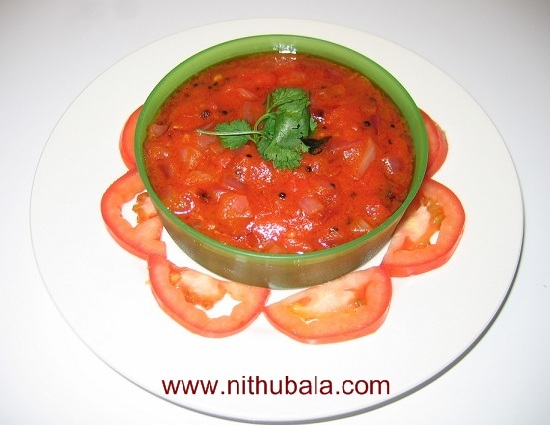 Tomato thokku looks very colorful and delicious. We love this thokku Nithu..Thanks a ton dearie for posting this..
wonderful thokku with beautiful color..
Fingerlicking and catchy tomato thokku, looks yummy..
Yummy thokku recipe. looks so good. Would be great with hot idlies... YUM! I make without onion,this one sounds good and what a bright red! the thokku looks great Nithu..
we make a similar thokku often and even today made some to have for breakfast with adai. yours one looks so good....love the presentation too very cute. Thokku looks yummy...i love it..
Lovely color, thokku looks tasty! Scrumptious, yummy and spicy tomato thokku. Love it.